The present EICASA Team has promised a fest. 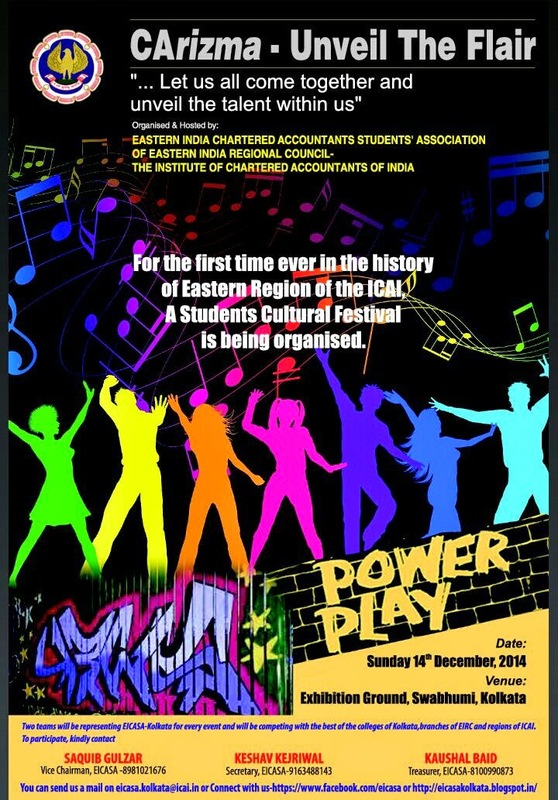 So, for the FIRST TIME EVER IN THE HISTORY OF ICAI-KOLKATA, we the managing committee members of EICASA , are organizing a Youth Festival-Carizma -Unveil The Flair. 5.TUG OF WAR etc, will be there. A Dj Night will be there in the latter part of the event.! Many colleges, branches and regions will be participating in this grand show. So guys, ARE YOU READY TO BE A PART OF SOMETHING BIG.? ARE YOU READY TO BE A PART OF HISTORY IN THE MAKING? PASSES WILL BE AVAILABLE FROM FRIDAY I.E. 5TH DECEMBER, 2014.
student and prepare him/her for a bright career. an excellent track record – more than 80% students have scored 90% and above in each of ICSE and ISC exams. We have on board a team of highly skilled faculty from reputed schools who tutor the students very carefully.